It’s good to finally to get the calculator that accompanies the Scientific Calculator Sourcebook that I bought years ago. 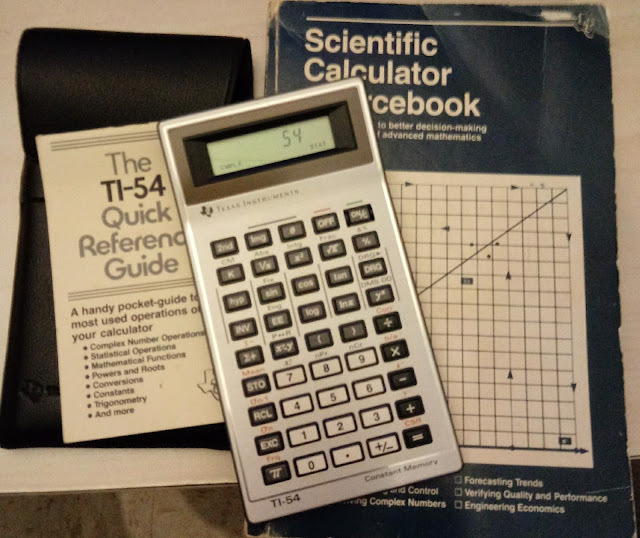 The TI-54 is a scientific calculator with a lot of additional features over the typical non-programming scientific calculator that was released at the time. I think the percent works backwards than modern calculators. Press the new value first, then [2nd] ( Δ% ), then old value, [ = ]. The TI-54 has one variable and two variable statistics, with linear regression of the equation y = a * x + b. The b/a key gives the intercept and slope. Predictive values and correlation are also available. The TI-54 also has percent change, absolute value, fractional part, and integer part. Other functions include degree/degree-minutes-seconds conversions and constant operations with [ K ]. Perhaps the biggest attraction of the TI-54 is the complex number mode. Complex mode is activated as soon as the complex number is entered. Since the display is one number, the real part/magnitude is default shown. To show the complex part, press [ EXC ] [ Img ]/[ θ ] to show the imaginary part/angle. The user will know if that the imaginary part/angle is shown by the CMPLX indicator is flashing. The amount of functions to complex functions offered are greater than most scientific calculators would offer, which is impressive at the time: arithmetic, power, natural logarithms, exponentials, square root, and square. Scientific calculators that were produced from Texas Instruments in that era (early 1980s) had a reputation for their not so great keyboards, affecting TI-54, TI-55 II, and TI-57. Unfortunately, the keyboard is the Achilles’ Heel for this model. On occasion, pressing the key doesn’t register, and occasion the key registers twice. This problem is prevalent on the number keys. So operating the TI-54 will require patience and maybe a few extra presses of the [ON/C] key. Other than this, the TI-54 worked well. If you are to purchase a TI-54, please be aware of possible keyboard issues, other than that it is a good calculator. Really feel so glad,when i and my friend watch and read it. Necesary information which i needed personally we get from these. Its too much help for me in my future.